We would like to wish you a Merry Christmas from everyone here at the ranch. We thank you for you kind thoughts, comments, and friendship. We are genuinely grateful for life, health, family, country, and our jobs. Hope your holidays are special this year! This is Pat. No, he’s not in the training program, just a little past that stage of life. Pat has senior status at the ranch and pretty well living the good life. He has earned his retirement and never paid one dime to Social Security. 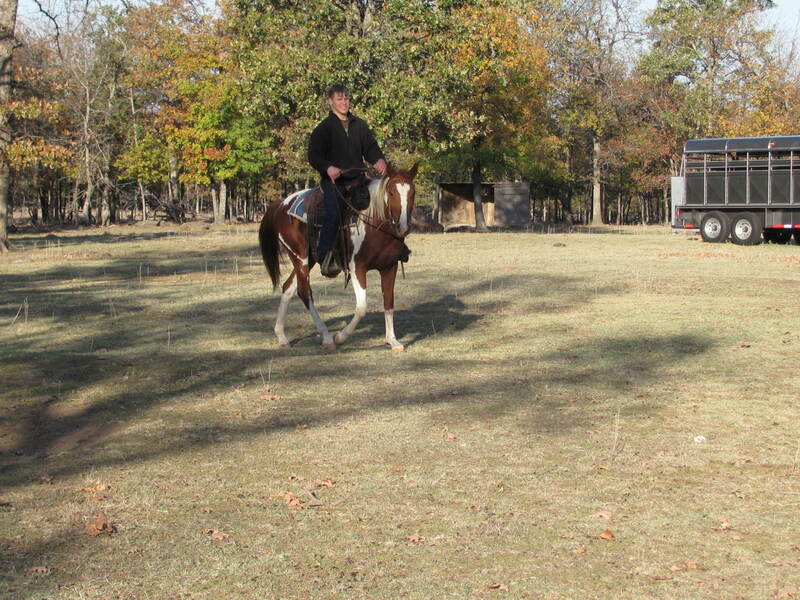 An unregistered quarter horse, we bought Pat over 15 years ago. He has taught a lot of people how to ride. When we talk about disposition in a trail horse, there’s none better than this gelding. He watched over countless kids learning to ride and helped a number of adults gain confidence by riding a horse that knows how to act. We don’t know Pat’s exact age, but estimate him approaching 30 years old. He was the type of horse you could leave in the pasture for 6 months and saddle up the next time you wanted to ride without a second thought. Not afraid of anything, Pat took the trails with a steady and surefooted pace. We still think he is a “pretty” horse. Not because he is the best looking horse we ever saw, but because we could trust him with a two-year old child or an 80-year-old lady. Yep, Pat earned his keep and put enough of those warm memories in our mind for us to just keep him forever. A good trail horse needs to load and unload from the trailer without fuss or trouble. Who wants to head out for a trail ride with friends and family and start the trip with a horse that won’t get in the trailer. Not us. We insist our horses step up and load without discussion and unload in a couple of ways. We teach them to unload by backing out and to turn around and walk out forward. The gelding shown here, P.J., has the trailer stuff down. He loads without blinking an eye and does a good job of backing out. Oklahoma State University has a wonderful equine program for those looking to work in the horse industry. It’s what you would expect from the school with Pistol Pete as the mascot and Cowboys for its athletic program. What Do You Mean That Horse May Not Like Me? As we have repeatedly said, horses have their own individual personalities with likes and dislikes. As with people, some horses do better with certain types than others. This doesn’t mean a well-broke horse can’t learn to adapt to the rider, but there may be a longer adjustment in some cases. It also doesn’t mean the rider can’t learn to ride the horse. About this stage of the conversation with a lot of people, we usually hear, “I don’t jump”. Really, well squeezing your legs against the horse suddenly and unexpected as you deeply inhale may not be a “jump” in your book, but it is in the horse’s way of thinking. Remember, the horse can feel the movements in the seat of the saddle, feel your legs, and see you. How do you react when someone sneaks up from behind you and pokes you in the ribs? Horses have varying degrees of “jumpiness”; some tend to react quicker than others to the unexpected. When you couple a horse and rider together that are both a little “jumpy”, the result is pretty easy to see coming. The horse is nervous because the rider is nervous. As the horse gets more excited, then the rider’s anxiety increases. This is just one example to illustrate why we work hard to match a rider to a horse with an appropriate personality for the rider. A calmer, slower reacting horse for riders that tend to be quick to react results in a better match. Again we don’t want to mean that any horse and rider can’t learn to work together, it just easier when the fit is natural. We have seen a few horses over the years that responded far better to females than men. Who knows the reason, they simply do. It doesn’t mean a man can’t ride the horse, but it probably means he will have a few more issues to deal with. At the end of the day, doesn’t it make sense to find a horse that suits your personality rather than fight the disadvantages of a poorly matched relationship. How many times have we heard, “But, I like his color! He’s sooooo PRETTY!” Your choice, but I personally would rather ride an ugly horse that I can handle than a pretty one that dumps me every couple of months. If you are out looking for a horse, give some thought to the relationship you want with your horse. Just like in love, the more time you spend in a good relationship, the prettier he or she becomes. We promise you riding a horse that takes you safely and quietly over the trails will start looking really pretty to you as the relationship grows. The good news if you look with us is we don’t have any ugly horses. Yep, we think they are all pretty!!!! And yes, we know beauty is in the eye of the beholder! Behind the Bit has a great Christmas video that you can’t miss. The first pony for family who never had one before. It’s a hoot and holler!!! Check it out! What Bit Should I Use? The debate over the best bit to use will never end. It has been a source of discussion for longer than most of us have been alive. There are a few keys to success in finding the bit that works best. First and foremost, we agree with Larry Trocha, “To my way of thinking, a horse should be ridden in the mildest bit that he will respond to for the job that he is intended to do.” Nuff said, just can’t make no clearer. Second, don’t use a bit until you understand how it works. Bits can be harsh, that means painful. Inflicting pain is not training. A horse’s mouth is sensitive just like yours. If you don’t know what you are doing and using a harsh bit, you will do far more harm than good. Using a bit without understanding what you are doing is no different from using dental tools without the proper training. You are just going to create a mess. As we have said many times and will probably say again, a plain old grazing bit is all you need for most horses that are properly trained. Depends on what you are trying to accomplish, but we guarantee the bit doesn’t make the trainer any more than the boots or the hat. If you want to know more about bits, take a look at Larry’s article for some background information. He does a good job explaining things. But bear in mind, reading a couple of articles doesn’t make an expert. Trainers like Larry have spent years learning how to use them. Our two-year trail riding program was started because we saw the need for well-broke, sound trail horses and recognized the value of them. A good horse is hard to find, but worth every penny! There are huge quantities of horses that aren’t broke, aren’t sound, and can’t be ridden by the average rider. The sale barns are filled with the same horses going through one-more time for the next unwitting buyer. Some horses just don’t make it through our two-year trail horse program. They may make a useable horse for a real experienced rider, but not be suitable for the quality trail horses we turn out. It can be the wrong temperament or disposition that renders them too impatient to meet our standards. It may be a physical impairment that prevents the horse from doing a full day of work or feet that are too soft to handle the rocks. Still the horse may be acceptable for some other purpose or need. When we have a horse that is unfit, rogue, or genuinely unsafe, we take it to the sale barn and put it in the lucky horse lottery just like everyone else. 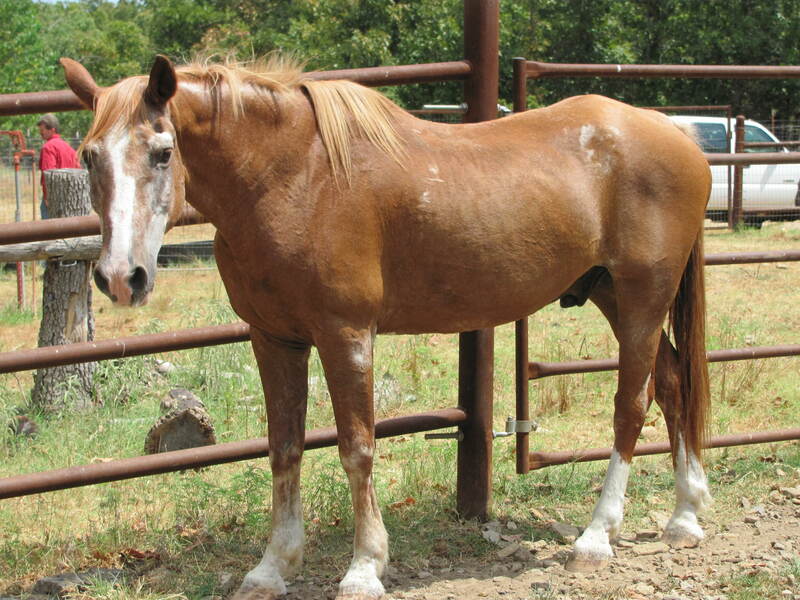 The horses you see on this blog are sold by the ranch with as much disclosure as we can give. We want people to know what they are buying before they spend the money. Our experience shows that not every rider is suited for every horse. The hospitals and orthopedic surgeons provide the proof. We always suggest that customers ride our horses several different times and try a number of them to find the one that is right for their personality and ability. We stress not everyone is going to be a superstar and you don’t need to be to have fun. Many people who contact us have considerable riding experience gained from years in various disciplines. These individuals have reached that stage of life where they still want to actively ride, but they want a horse that is ready to use. They have done the training route and understand the time it takes and the risks of riding inexperienced or even green horses. Although no one can assure an accident won’t happen, a good, well-broke horse can be the difference. It only takes one ambulance ride and overnight stay in the hospital to easily pay the cost of a good horse. Not to mention, the pain associated with being thrown, bucked off, and injured. Our goal is for people to safely ride and enjoy life. Horses are a great way to get some exercise and enjoy the world from a view-point like no other. We also get contacted by busy professionals who want to ride, but have demanding jobs that don’t always give the time they would like to spend riding. They just don’t have the hours it takes to work with a green or unbroken horse. While many long to ride every day, they just can’t. So when their day off finally arrives, they don’t feel safe climbing on their horse because it isn’t trustworthy. So they end up not riding, but lounging their horse in circles. If you are looking for horse you can actually ride and enjoy, you might take a look at the horses listed in the for sale category. Let us know if we can help you find that special horse that will be the perfect fit for your needs. For us halters are just another tool. We need them strong enough to hold a stubborn horse that sits back to deliberately break the rope or to keep a panicky horse from getting away. Once a horse has properly learned how to act, nearly any style will work. We still have a few old flat halters hanging around, but generally use the rope halters. Every once in a while a horse will decide to test a situation and we want him to remember the need to give to the pressure. Billy Cook Saddlery makes a moderately priced western saddle that works well for trail riding. We like Billy Cook because the saddles are a working saddle that will take a fair amount of use without breaking down. The saddles tend to fit quarter horses pretty well and make a comfortable ride for the horse. Comfort for both the horse and rider are important when you spend 10 – 12 hour days in the saddle. Billy Cook saddles are used by a lot of working cowboys. If you get interested in a Billy Cook, it is important to confirm it is a genuine Billy Cook from Sulphur, Oklahoma. You can’t purchase a saddle direct from the maker; instead you have to go through a reseller. We have bought many of ours from the Allen Ranch Saddle Shop. Stanley Allen, the owner, is a straight-up, hard-working saddle maker that will treat you fair and square. Stanley also builds custom saddles if you want something extra. He can make or get you anything you need. If you are going to ride horses, good equipment makes a world of difference. In our experience, if you cut corners, it will usually cost more in the long run. Cheap saddles break and wear out pretty fast. A poor quality saddle that breaks while you are riding is inconvenient. It can also result in accidents. You are currently browsing the horsesfortrail blog archives for December, 2012.